My name is Laura and I’m a wife, cook and mom to Jorge Daniel. I started sharing my recipes with you some years ago to lose weight and now we are an entire community dedicated to our health. 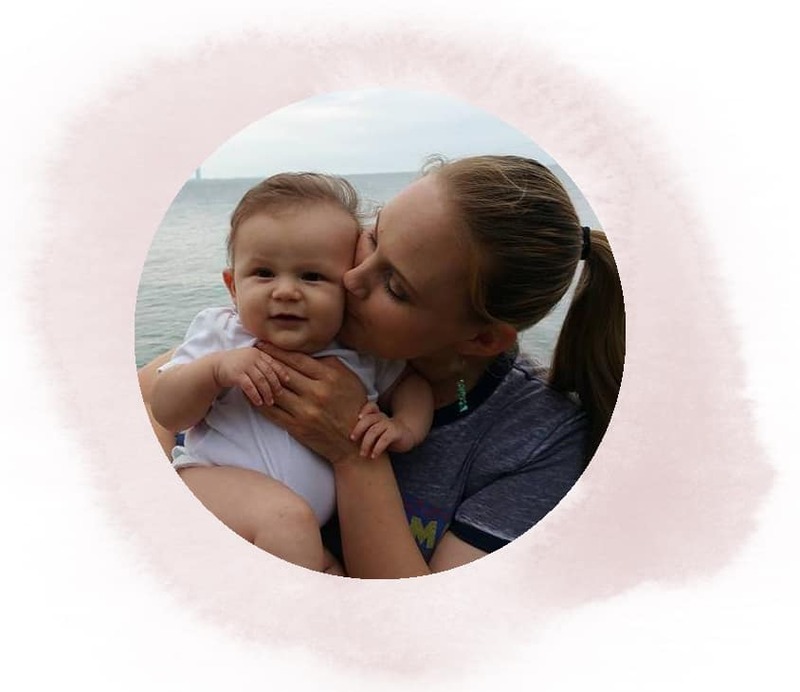 I love to share with you every step of my life, my marriage and now in my new role as a mom, tips for babies and lifestyle, learning something new together each day. That last resolution encompasses it all: DEDICATE MORE TIME TO MYSELF. I don’t know the precise moment my life became a chaos. I got a master’s degree in journalism, I had an online business with my sisters and I worked for a government agency. I gave conferences and was often invited to coordinate journalists for special international events. I traveled a lot and wrote a weekly Sunday column for several newspapers. I finished a book and I still wanted to begin to study for another master’s degree. I was involved in everything but myself. Stress, poor diet, lack of exercise, slow metabolism, genetics, my cravings, my addiction to sugar and my habit of worrying about everything ended up putting me at 104 pounds above my ideal weight. I’m tall, I’ve always been told I am beautiful – fat or thin. 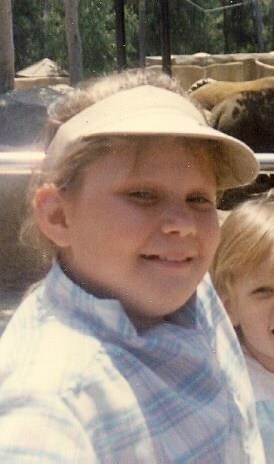 I liked to think I was voluptuous, although as a girl I always wanted to be thin, petit and short. I wanted to be those girls who were smart and organized – the kind they choose to wave the flag or the guard in primary school. It was then that I made a complete change in my life and three years later, I lost more than 110 pounds by eating healthy with the healthy nutrition program I share with all of you today: THE CHALLENGE. Staying fit and healthy has not been an easy road… I have to plan my meals for the week, cook and wash loads of dishes. I have to bring my own food sometimes when I go out. I need emotional support; I have to abstain from things I like to eat. Nevertheless, all my efforts to this day have been worth it especially because I have not only met my goals, but I’ve helped many others reach their goals by sharing my recipes with them. Those years I decided to dedicate to myself helped me learn many things, things that I can now share with many people through this webpage, through my Youtube videos and my social media. 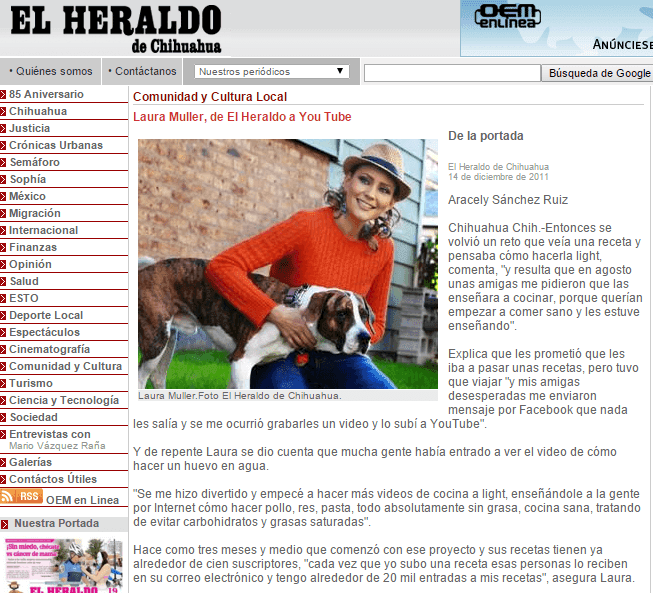 Laura Müller is a Northern Regional University (Universidad Regional del Norte) graduate in Communication Sciences with a postgraduate degree in Journalism from Canterbury University in New Zealand. 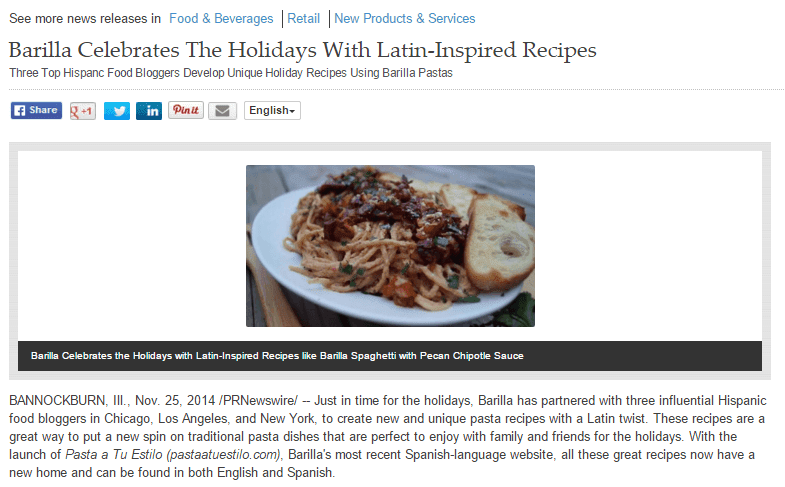 He battle with her weight, the search for health and diabetes prevention have led her to a new passion found in the creation of delicious recipes that have a low calorie count without sacrificing flavor and nutritional value. Her travels to four continents have led her to discover new dishes and have given her gracefulness in combining the flavors of diverse cultures and nations to keep happy palates and grateful metabolisms. She has also received special invitations to be cast in cooking shows such as Master Chef. 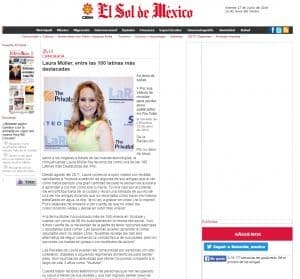 As a journalist, she has freelanced for several media communications, one of them being the Mexican Editorial Organization, with a weekly Sunday column that was published continuously for three years. She has been invited to cover events with television stations and newspaper publications in New Zealand and Canada. She has worked on collaborations for magazines like Pets Magazine and VOIX of UNICEF. Laura’s trajectory as a speaker has allowed her to stand on stages in countries like Canada, United States, New Zealand, Dominican Republic and Brazil. She is the author of the book Ruleta Urbana (Urban Roulette). 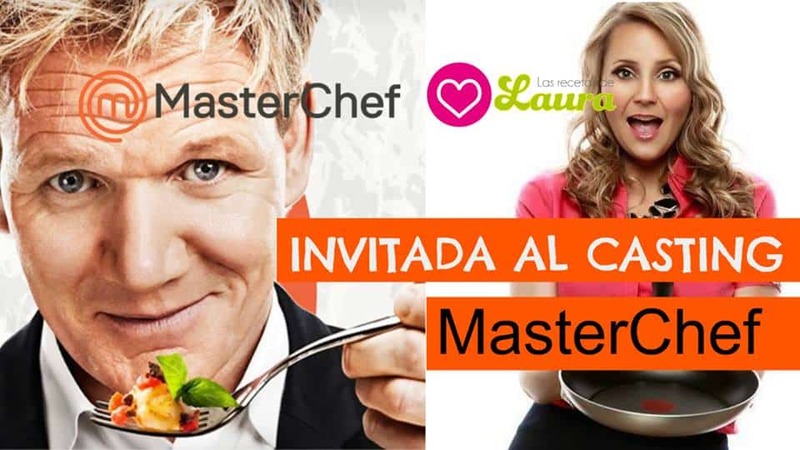 She has been invited to several radio programs in the Univision chain and has participated in health capsules for Azteca America and has shared her recipes on Mundo Fox, Telemundo, Televisa and Canal 67 of El Salvador. 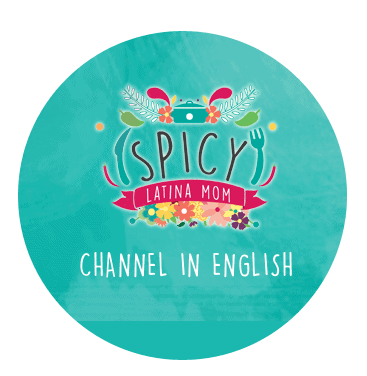 In March 2014, she was recognized on as one of the top 100 most outstanding Latinas of the year for her healthy recipes on Youtube. In March 2015 Salud 180 magazine and MSN Prodigy profiled her as one of the 7 most outstanding women in the health and sports. She supports several health conscious civil associations to spread her message of how to live a more healthy life. 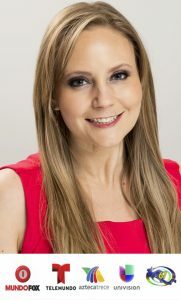 Laura also completed postgraduate studies in Family and Gender Violence at the National Autonomous University of Mexico (Universidad Nacional Autónoma de México). She also has a postgraduate degree in Information Law from Konrad Adenauer and the Autonomous University of Chihuahua (Universidad Autónoma de Chihuahua) as well as a degree in Travel and Tourism from City University of New York. She is fluent in English, Portuguese and Spanish. 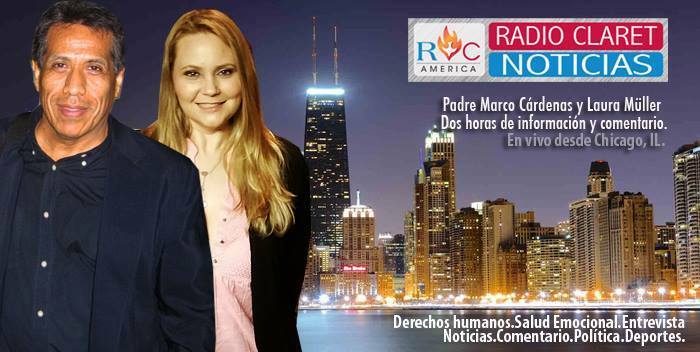 She is currently working in Chicago, Illinois where she works as a full time radio host on Radio Claret America. Ruleta Urbana. This book is the collection of columns published for more than 3 years by the OEM in which Laura narrates her anecdotes during the different stages of her youth, from travel and experiences Laura added a spark of youth and fresh writings with the strong XXI Century woman personality, angle of his graceful and fine scriptural style. 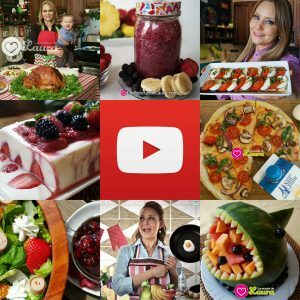 In March 2014 she was recognized as one of the 100 most outstanding Latinas of the year for her healthy recipes project on YouTube with which she has managed to reach more than 800 thousand followers on her social platforms and through her healthy eating program helping thousands of people to recover their health. 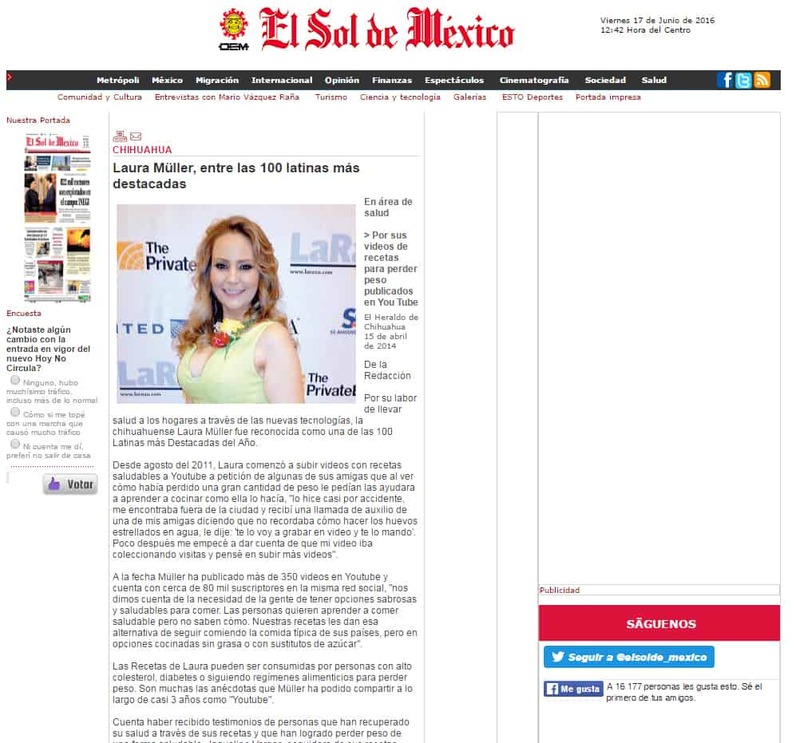 Laura Muller recognized as one of Latin America’s 100 most prominent health professionals for creating healthy recipes to fight overweight and prevent diabetes without sacrificing the nutritional value and flavor of the dishes. Author of Urban Roulette and international lecturer. For her work to bring health to homes through new technologies, Chihuahua Laura Müller was recognized as one of the 100 Most Outstanding Latinas of the Year. Since August 2011, Laura began uploading videos with healthy recipes to Youtube at the request of some of her friends who, seeing how she had lost a lot of weight, asked her to help them learn how to cook as she did, “I did almost By accident, I was outside the city ….